This is a wonderful movie and has been release just in time for the holiday spirit. This is a great movie to sit back and enjoy with you friends and family as you take a magical journey. I know my kids will be snuggling up tonight to enjoy this one! 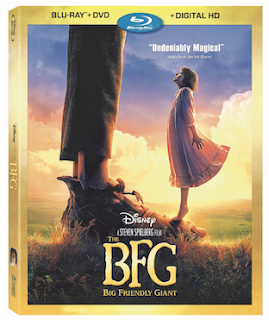 Disney and Amblin Entertainment, in association with Walden Media, present the fantasy adventure film “The BFG,” the first-ever motion picture adaptation of Roald Dahl’s resonant tale of childhood, the magic of dreams and the extraordinary friendship between a young girl and a big friendly giant. Directed by three-time Academy Award® winner Steven Spielberg, the film reunites the director with his Oscar®-nominated collaborator on “E.T. the Extra-Terrestrial,” Melissa Mathison, who adapted the children’s author’s timeless adventure for the big screen. This magical tale of an extraordinary friendship loaded with exciting extras will brighten the holidays for the whole family!